Nintendo's strategy of remastering and re-releasing its first party Wii U back catalogue continues to pay off handsomely, with Retro Studios' Donkey Kong Country Tropical Freeze making the transition across to Switch with some excellent results. It's a game well worth resurrecting - with its potent mix of fantastic controls, great level design and a memorable David Wise soundtrack, it's a personal favourite I've continued to play years on from its initial release - but how does it stack up on Switch and what enhancements and refinements have been made? Well, it turns out that this is a rather straightforward port with a few minor tweaks and changes designed to take advantage of the Switch's more capable hardware. It's a more polished, streamlined experience all around, with the stand-out improvement coming from rendering resolution, where the Wii U's native 720p is increased to full 1080p when playing docked on Switch. The visual design works well at 720p and the bump to 1080p allows smaller details to shine but it might surprise you how subtle the jump in pixel count can appear in many scenes. Textures are certainly sharper on Switch, but the fixed perspective helps minimise image noise and aliasing on the Wii U. As for portable mode, our pixel counts reveal a resolution in the area of 1152x648. In determining this figure, we examined numerous levels in search of a potential adaptive resolution implementation but came up empty - Tropical Freeze appears to use a fixed resolution. When playing on the Switch's LCD screen a touch of blur is evident thanks to the sub-native resolution but, as we saw on Wii U, the design of the artwork helps to mitigate the issues inherent in sub-native output on a fixed pixel display. Either way, Tropical Freeze is still a lovely game. It's not cutting-edge, but it does demonstrate the benefits of an optimised engine and thoughtful art direction. For the most part, the Switch version of Tropical Freeze looks visually identical to the Wii U version but there are some very minor changes: a subtle difference in Kong's fur shading and other environmental effects for example, while some aspects of the rendering pipeline seem to be tied to resolution. 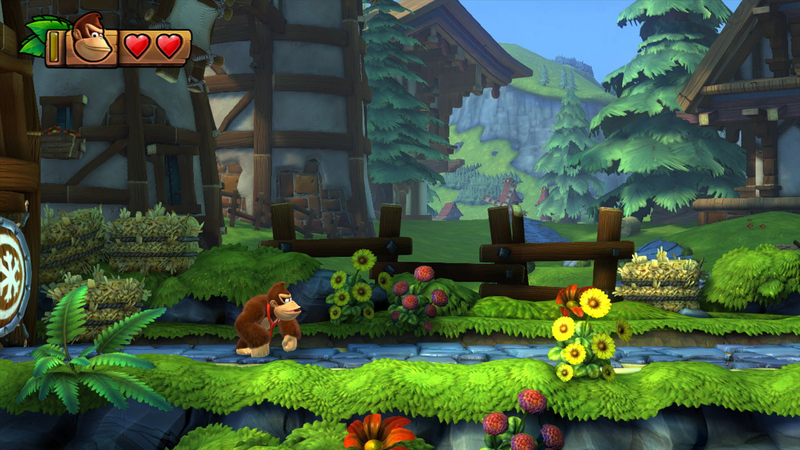 Bloom lighting increases its radius at lower resolutions, so this effect looks closer to the Wii U original while playing in portable mode, while appearing more muted when docked. Our video breakdown of Donkey Kong Country: Tropical Freeze. Yes, the Switch is getting deluged by ports, but Nintendo's first party fare always looks great and runs well on the console hybrid. Aside from these minor visual tweaks and the increase in resolution, there isn't much else in the way of visual enhancements. It's difficult to complain when the game looks this nice though, and it is certainly a lot better than DKC Returns on 3DS, the last attempt at bringing Retro's Donkey Kong game to a portable Nintendo system. Visuals aside, there is another major enhancement worth discussing - loading times. With its lack of hard drive, the Wii U is not known for speedy loading times and even Retro Studio's magic touch wasn't enough to fully overcome these limitations. Starting the game has a 40 second loading time with DKC running from disc on Wii U, which is cut down to a mere 11 seconds on Switch. Popping into an actual stage proves faster but the Switch is still nearly twice as fast here, making it easier to pick up and play. And there's more good news too - performance is on-point here. Since its work on Metroid Prime and its sequels, Retro Studios has always placed an emphasis on a smooth 60 frames per second frame-rate and Tropical Freeze is no exception. Unsurprisingly, when docked, the Switch has no issues powering through every level in the game at the target frame-rate. Not once throughout my play session did Tropical Freeze ever drop a frame or exhibit any sort of hitching. It's one of those rare games that manages to completely avoid slowdown. The resolution when docked is increased to a full 1080p while the portable mode is limited to 1152x648. 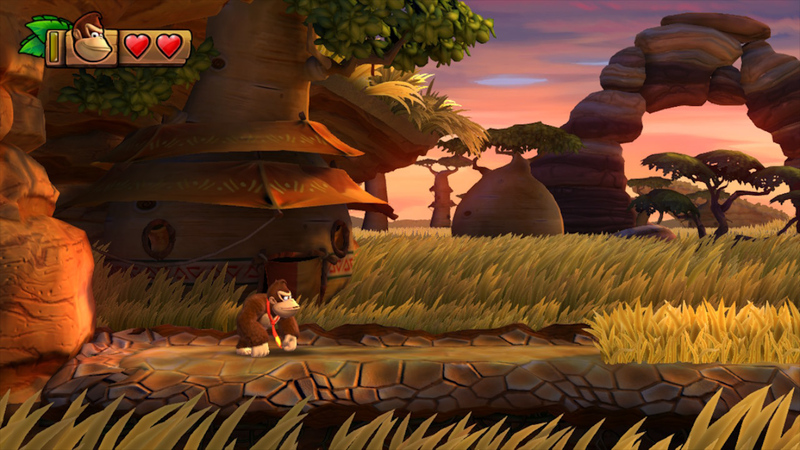 Some effects, such as the bloom lighting in this stage, vary based on resolution. The increased resolution improves texture clarity across the board but it's especially evident in thing such as the flowers and hay scattered around the stage. Aside from the resolution increase and faster loading times, the Switch version looks roughly the same as the Wii U original. This includes the same excellent camera work featured heavily throughout the game. 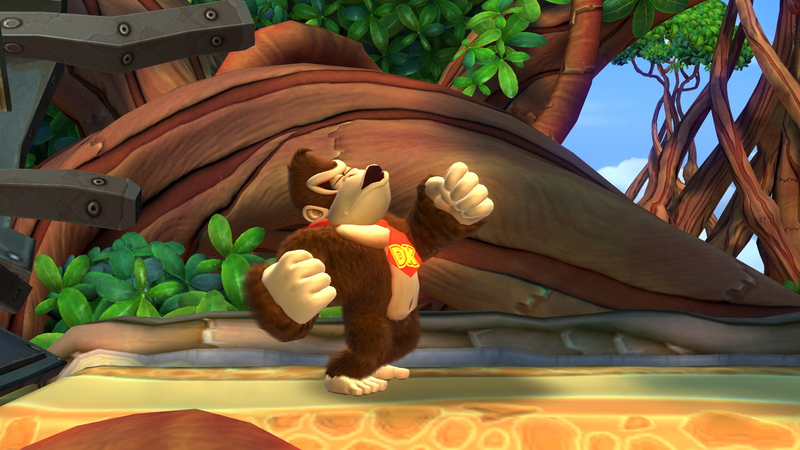 The fur shading and lighting on Donkey Kong receives a slight adjustment on Switch. Kong now blends more naturally into the environment. Of course, there's always that 0.1 per cent chance of a dropped frame here or there but I was unable to locate even a single missed update. It's very stable. And better yet, the same is true of handheld performance. This is where frame-rate is even more critical. The 3DS port of DKC Returns with its 30 fps frame-rate was a disappointment so it's great to see its sequel perform so well in handheld mode. Beyond the performance and visual elements, there are other aspects of the Switch release worth mentioning. Tropical Freeze requires just 6.6GB of space on your system if you purchase the digital version of the game, meaning that there's no bloat here - it won't occupy much of your MicroSD space and it'll comfortably sit on the system's own internal NAND. Ultimately, while this is still very much the Wii U game, Tropical Freeze is as good as ever. The enhancements are welcome but not essential, yet the game is so good that it's worth replaying even if you've owned it in the past. It's also another example of how smart visual design and smooth performance can help a game age like fine wine. There are so many wonderful visual and audio details throughout the game that still impress. 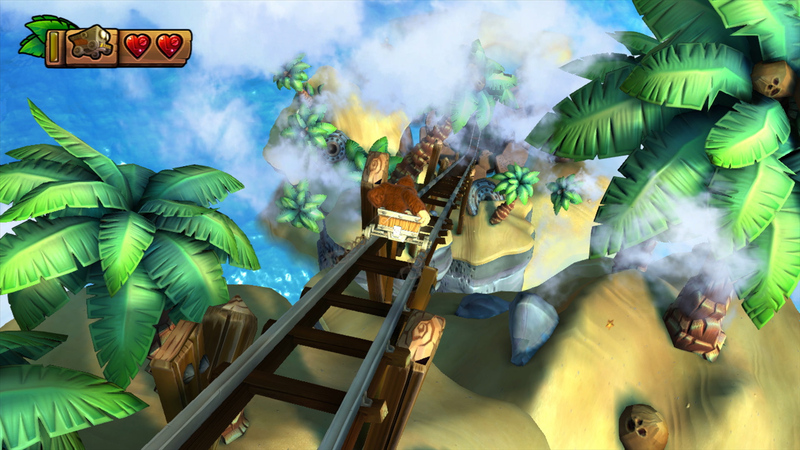 The way music fades seamlessly between above ground tracks and underwater tracks, for instance, or the fluid animation prominently featured throughout the game. The dynamic camera work is also just as good as ever it was. Tropical Freeze was always one of my favourite platform games and the Switch port offers a nice visual boost over Wii U when docked, while still delivering a smooth, highly playable portable experience. The Wii U ports continue to arrive in force on Switch - some good, some bad - but Nintendo's first party releases for the old system still hold up today, and Tropical Freeze demonstrates this beautifully. Donkey Kong Country Returns again.